One unit in the SU Libraries that did not exist even a few years ago is the MakerLab. Launching in fall 2016, when the Guerrieri Academic Commons opened, the MakerLab was an experiment. 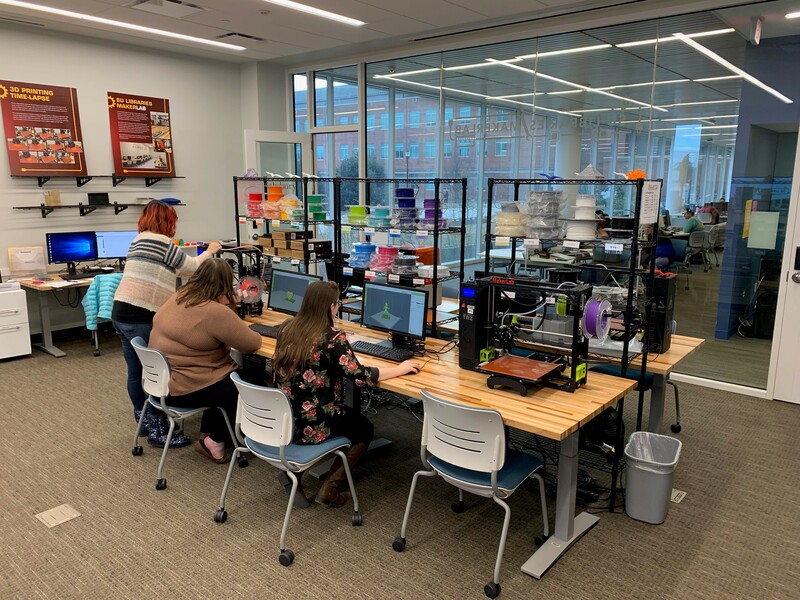 While academic libraries have more traditionally supported students in the creation and sharing of information via two-dimensional or electronic items such as papers or posters or videos, the MakerLab allows for the creation and sharing of information via three-dimensional objects. The MakerLab provides technology as well as training and assistance in using technology. The technology includes several types of 3D printers, 3D scanners and a virtual reality headset, in addition to single-board computers and microcontrollers such as Raspberry Pis and Arduinos. Novices receive one-on-one training from the MakerLab staff, who also offer workshops. Staff members always are available to help with trouble-shooting as well. So what kinds of things do people do at the MakerLab? The neatest project probably has been the work of Annelise Beer, a senior interdisciplinary studies - archaeology major who started her project elsewhere before shifting it to the Libraries’ MakerLab. She used a 3D scanner to scan fragile fragments of the skull of an Iron Age infant and then printed the pieces on our most sophisticated 3D printer, which she now is using to try to recreate the skull. Other users have a variety of goals, both academic and non-academic, in using the MakerLab. Education students, who will be teaching in elementary and secondary schools that most likely will have 3D printers, use the MakerLab in developing learning aids, such as aids to visualize fractions or geometric shapes. Art students sometimes mock up sculptures on a miniature scale before heading to their studios to create the full-size sculptures. The art students also use the VR headset to work on 3D drawings. And many people, of course, use the scanners and printers for personal projects, such as holiday decorations or gifts, such as a little horse figurine for someone who loves horses or an Eiffel Tower as a reminder of a trip to France. The MakerLab does charge for successful prints, only to recover the cost of supplies; many departments cover those costs for students working on academic assignments. Otherwise, use of equipment and all training and assistance are free. The MakerLab is open most days during the fall and spring semesters.